The HVA90 hipot testers from Macey's Electrical are an advanced line of high voltage testing systems designed for hipot testing or proof testing applications. Conventional DC or hipot testing of aged extruded cables such as XLPE and EPR can be potentially damaging to the cable insulation causing premature failure of the cable under service conditions. Additionally, DC proof testing or hipot testing has been found to be ineffective in detecting serious defects in cables. Since this is the main objective of any hipot test, VLF AC waveform testing is now recommended by almost all cable testing standards. Acceptance or maintenance hipot/ proof testing using VLF high voltage sinusoidal AC allows the operator to efficiently detect serious cable insulation defects before they result in an in-service failure. This testing method does not affect healthy sections of the cable that still have some service life left. 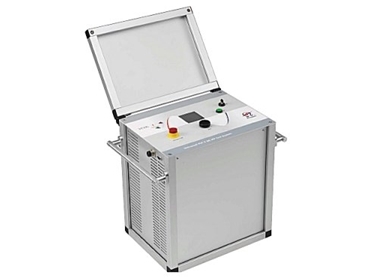 HVA90 hipot testers provide testing and commissioning engineers with a versatile high voltage power source suitable for testing electrical plant equipment including cables, capacitors, switchgear, transformers, rotating machines, insulators and bushing. HVA90 hipot testers are also lightweight and compact instruments designed to offer the highest power to weight ratio of any comparable unit available. The instrument is easily programmable allowing the operator to set up or select test sequences in either automatic or manual mode. HVA90 hipot testers can be used to test 1µF (3300m/ 11,000 ft of cable) at 0.1Hz and 64kV rms. The frequency of the output can be reduced allowing even larger capacitance loads to be tested. At 0.01Hz, approximately 33,000m/ 100,000ft of cable can be tested. To assist the operator, the instrument will automatically calculate the optimum frequency to be selected for larger loads. Should a breakdown occur during testing, the actual voltage at which it occurred is displayed and recorded. If cable burning (fault conditioning) mode is activated, the fault resistance can be conditioned to allow easier and less stressful fault location techniques to be applied.